It is simply a story in need of good telling, says Eric Hicks, chess teacher and hero to thousands of elementary school children, teachers and administrators. Imagine a king and a queen so vain they never stand next to their knights because knights are their horses. Horses stink and fling spit on their clothes. As for pawns, they are wimps. Pawns can march only forward; if allowed to go backward they would run home to their mommies. The roomful of second-graders at Valencia Elementary School in Laguna Hills giggles and claps at their chess lesson. 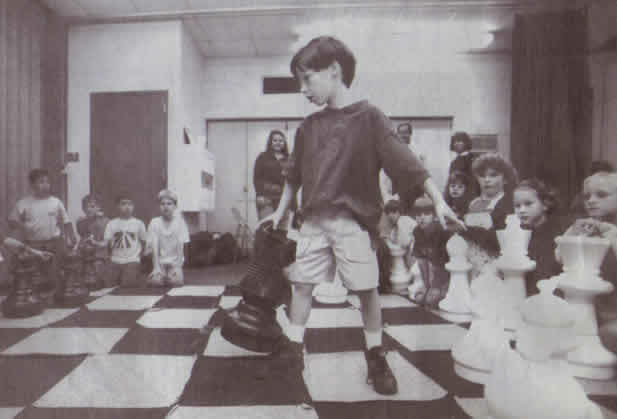 Hicks, 26, created Academic Chess, a program that teaches chess in elementary schools. He figures he has introduced chess to about 12,000 students in Orange County. "The kids play all the time, at recess, lunchtime, before and after school," says Mickey Shannon, second-grade teacher at Valencia. The generation raised on Super Nintendo and computer games is finding a whole new thrill in the face-to-face challenge of the staid old board game. "Now there's something fun to do at recess," says Jenny Lynn, 11. "I play at home, but it's more fun to play here with my friends," says Daniel Espinoza, 11. On Friday nights, Hicks sponsors tournaments where hundreds of students show up to play chess and munch pizza for three hours. "It's crazy, and without the pizza, the whole things would probably fall apart," Hicks says. "But it's great to have so many kids playing chess." Hicks says it's his destiny to teach kids to play chess, an unlikely life for a high school dropout. Hicks is a senior at John F. Kennedy High School in Granada Hills. He is a special-education student. Military brat. Failing all his classes. Kennedy is the 15th school in his educational career. "I had a 1.4 GPA. So I quit," Hicks remembers. "There are always the losers in high school, and that was my crowd. I didn't have anything going for me. But I always wanted to go to college and be smart. I used to go crying into the counselor's office, trying to get into college-bound classes." He landed instead on his knees at Taco Bell, scrubbing floors. On a really good day, he would get to refry the beans. His mother kicked him out of the house. Hicks moved in with his father in Hawthorne. Bored, Hicks often rode his bike to Santa Monica Beach. There, he discovered the chess players. Hicks had learned to play chess when he was 5, but it was a forgotten talent. "All of a sudden I was hanging around guys that went to college and I could keep up with them in chess. I was succeeding in an academic environment and I started to acquire some self-esteem." He entered tournaments and won. Bolstered by winning "a smart person's game," he decided to try school one more time. He signed up for a creative-writing class at El Camino College in Torrance. "I was good at it. I did really well. Something changed." Hicks thinks he has undiagnosed attention deficit disorder. "Chess taught me to focus my mental energies. Weekend tournaments require six hours of concentration every day for four days. After sitting through that, sitting through a class was easy." He graduated from El Camino College with a two-year degree, finishing high school requirements at the same time. He was accepted at the University of California, Los Angeles, UC Berkeley, and UC Santa Barbara. He chose Berkeley, enrolling in fall 1989. He paid his way through college teaching for The Berkeley School of Chess, an in-school program for elementary-age kids. His favorite classes were in Oakland inner-city schools. "They had this really cheesy program going there called Kids Are Special, and it was supposed to give kids self-esteem. They played little songs and drew pictures. I didn't see it as effective at all. "I taught them how to play chess and they seemed to be interested. When they figured out they were capable of playing something smart they felt really good. I think rather than trying to convince someone they're special, if you can give them an activity to prove it they're better off." His students went on to win third place at a state championship. Hicks graduated from Berkeley in 1992 with an English literature degree. He won the Eisner Award for fiction, Berkeley's most prestigious writing honor. Hicks writes short stories, blackly humorous. He's working on a manual for chess teachers using the stories he tells students about the chess pieces and game strategy. "He's one of the best writers I've ever met," says Alix Schwart, who taught Hicks at Berkeley. "He's also one on the most unorthodox people I've ever met. He blew the Eisner award, about $700, on an all-you-can-drink sake party with a live band for his friends. He's very absurd and extremely original." Hicks had married his college sweetheart, Laura, and moved to San Clemente. He worked as a medical clinic manager, a software-manual writer. He was considering a job selling pesticides to large businesses when he decided to try harder to earn a living teaching chess. 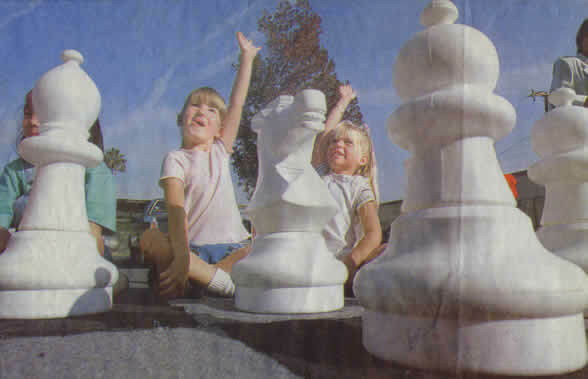 Hicks began teaching chess as a volunteer at Las Palmas Elementary School in San Clemente in 1993-94. Don Mahoney, assistant principal at Wood Canyon Elementary School in Aliso Viejo, heard about the chess teacher and invited him to the campus. "He became a legend in a short period of time. Students fell in love with him," Mahoney says. "He's turned kids around. There was one in particular I had difficulty with. He was always in my office," Mahoney says. "Now all he wants to do is play chess. He played and did well in a districtwide tournament. He helps Eric with the after-school club. He's never any trouble anymore." Mahoney spread word of the chess man to other schools. Principals scrambled to get Hicks into their classrooms. The program was not immediately embraced by all teachers. Karen Dahlquist, a sixth-grade teacher at Valencia Elementary in Laguna Hills, remembers the day she was approached about giving up class time so the kids could have chess lessons. "At first I was like, 'Yeah, right, do we have to do it?'" she says. "And now it's the biggest thing. 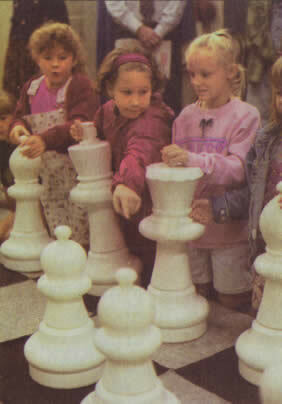 The kids love chess day." Chess day has turned into every day at Valencia and the other campuses where Hicks has offered his free classes. Afterschool chess clubs are full and recess chess encampments are as familiar as football games, soccer matches and hopscotch. Hicks hopes his chess teaching will grow to satisfy his wallet as it is satisfying his soul. For now, the on-campus lessons are free, and the after-school chess clubs represent only minor income. Academic Chess has 13 teachers and 10 tournament directors offering a series of three, free, in-school classes to elementary schools. Weekly after-school chess clubs can be formed after the introductory classes so that children will continue to learn. Clubs are $6 per session. Check the action at chess tournaments on Friday nights at Valencia Elementary School in Laguna Hills and Palisades School in Capistrano Beach. The three-hour tournaments feature instruction, pizza, soda and trophies for $8. For more information about how to get chess started at your school, call Eric Hicks at Academic Chess (949) 770-9720. On a recent day at Valencia, more than 20 chess boards are spread on the asphalt near the handball backboards. Red playground balls careen into the boards almost as often as first-graders yell "Check!" Hicks sits cross-legged in the middle of the fray, playing four games at one time. A plastic green spider ring dangles from his pinkie, a prize for the child that plays the best game. "Chess is fun," says Thomas Tran, 8. "I practice because I play against my whole family," explains Luis Colon, 7. "I'm the best." Hicks surveys his kingdom with a grin. "My goal is to teach every kid in the world how to play chess." He breaks into a snicker and sweeps his hand across the scene, sending the green spider bobbing on his finger. "I never thought chess would take off like this. This is a dream come true."